Steve King was Stripped of His Committee Positions for his Racist Comments. That’s Not Good Enough. Representative Steve King (R-IA) has been stripped of his committee positions in the House of Representatives thanks to his recent racist statements. He’s getting off light. King is outwardly racist. There is no question as to whether or not his statements are dog whistles, as he has been racist at face value often and the dog whistles he does use strike even the most resilient ears. The statement that got him in trouble, in this case, was “White nationalist, white supremacist, Western civilization — how did that language become offensive?”, a textbook example of normalizing racism by questioning those who find racism itself to be angering or upsetting. Yet this isn’t King’s first racist rodeo. In 2006, he called for an electric fence on the border. In 2010, he claimed “racial profiling” was “an important part of law enforcement”. In 2012, he latched on to racist birtherism, claiming Barrack Obama’s parents devised a wildly illogical plan to telegram him a fake birth certificate for the State of Hawaii. The next year, he called Abu Ghraib torture “hazing”. In 2015, King bizarrely questioned whether Julian Castro was “Hispanic or Latino” at all. In 2016, he proudly displayed a confederate flag on his desk, removing it only after two Iowa police officers were shot by a man waving a Confederate flag. Apparently, that was a bridge too controversial even for King. That same year, he stated: “This whole ‘old white people’ business does get a little tired, Charlie. I’d ask you to go back through history and figure out where are these contributions that have been made by these other categories of people that you are talking about? Where did any other subgroup of people contribute more to civilization?”, defending a historical approach to biological racism. In March of 2017, he took a shot at interracial marriage and stated “you can’t restore our civilization with someone else’s babies”, later calling for a world in which Americans were more “homogenous, looked more of the same”. The statement earned the praise of the world’s highest traffic white supremacist site the Daily Stormer, as well as KKK Grand Dragon and infamous white supremacist David Duke. In June of 2018, he said he did not want Muslims working in meat-packing plants. A few months later, he peddled anti-Jewish dog whistle conspiracy theories about George Soros. He has backed far-right nationalist racists in various elections around the world and pushes conspiracy theories about intentional decreasing of the white population by “minorities”, which, like all racist theories, is as stupid as it is racist. Racists like King who pour gasoline on the dumpster fire of white supremacy have set a dangerous precedent for a long time. Modern American history is littered with white racists, but it’s not the first setting where they have established a frighteningly large foothold. Racists operate through rhetoric that attempts to ridicule the divide between what is racist and what is not, as well as what should be taken seriously and what should not. The Daily Stormer says as much in its style guide, stating “the unindoctrinated should not be able to tell if we’re joking or not”. In this manner, eventually, dehumanization becomes the standard. 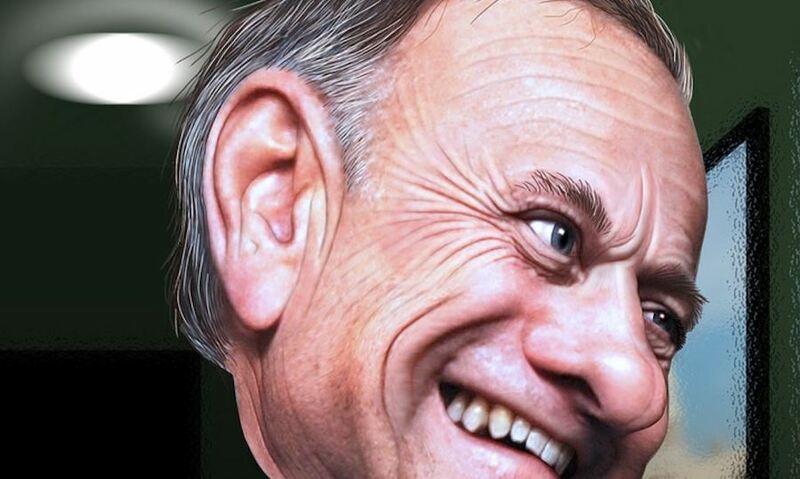 From this perspective, Steve King is a textbook racist with a dangerous perch. Of course, the same can be said of Donald Trump, whose racism, sexism, and other bigotry have been every bit as vicious as those of Steve King. Yet Trump and King both continue to enjoy the support of their party. So-called moderates such as Chuck Grassley fold; Grassley backed King for reelection. And the Republican party threw their lot in for Trump one by one like Dominoes as it became clear they were powerless to stop him from receiving his party’s nomination. The truth is that most of the internal GOP “punishments” for racism are meaningless head fakes; if the House Minority Leader Kevin McCarthy had wanted to make a statement against racism, he would not have stopped with King’s committee. He would have, at a minimum, called for his resignation. Has your rep or your senators called for King’s resignation? Demand that they make him step down. Tweet at them or call immediately.